INDEX-6 provides clean and fresh milk in Malaysia. Summerfield Milk is a Malaysian milk brand supported by the local farmers who produce organic milk and send the fresh product straight to HAD Company for processing every day. 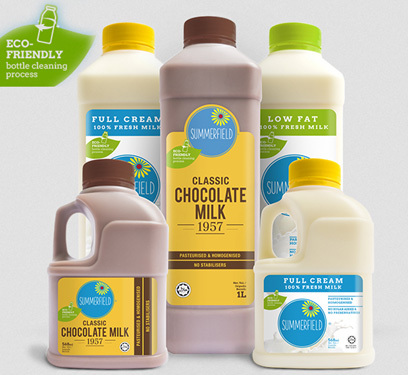 The company’s mission is to use an Ultra Clean bottling line for fresh milk without preservatives. This was implemented by means of a INDEX-6 multi-block (AssetClean) which complies with the Eco Friendly sterilizing process for the bottles using special ozonating technology without chemicals. The use of ozonated water guarantees the high level of hygiene of the CleanRoom processes, and ensures a highly-pure environment for the filling with fresh milk. All this is controlled by the special flow control valve which optimizes the level of filling and preservs the nutrition qualities of the product. These qualities are listed on the packaging as well. The closing section allows the use of a sterilizing technology for the lids, with full guarantees for the good preservation of milk following all transport requirements and preservation at 2 to 4оС. The block is unique in terms of flexibility for the usage of different-sized bottles. The hygiene of filling and the secure closing are its priorities. A number of new digitally-operated features, controlled by a single operator, contribute to this effect as well.